Earlier in the term a group of my kids created an aquarium in the water trough using leaves they'd found for fish. They swam their 'fish' around for a bit then one child declared that some fish were very sick. They promptly got out the clipboards and started tallying up and keeping notes on the fish that needed medical attention. 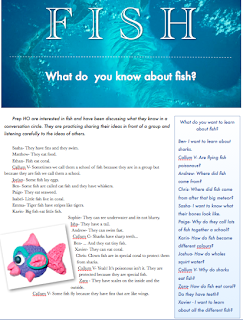 During reflection time that day when the children shared with the class what they had been doing J announced that we should make an aquarium in home corner. This idea was well received amongst the others and so we launched into learning about sea creatures and creating our aquarium. We made a list of the things we already knew about sea creatures and then wrote down some things we wanted to find out. B wanted to learn about sharks (and so did many others - mainly my boys). A said that he wanted to know what a sharks bones looked like and so we set about finding out. We looked through shark books, a few good websites about sharks and examined a few models showing the inside of a shark. 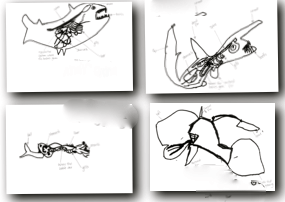 The boys (and a few girls) were enthralled and drew their own sharks - bones (or cartilage as we found out) reproductive system, intestines and all! They even wanted to label them (with help from me and my teacher aide) after seeing this in a number of the books we had read. I think they did an amazing job!